Sidney Crosby set up three goals as Pittsburgh stomped Nashville 6-0 in Game 5 of the Stanley Cup final on Thursday night. Evgeni Malkin and Phil Kessel were among the six different goal-scorers for the Penguins, who are now one win away from becoming the first repeat Cup winner in almost 20 years. Sidney Crosby has the Pittsburgh Penguins on the verge of back-to-back Stanley Cups. 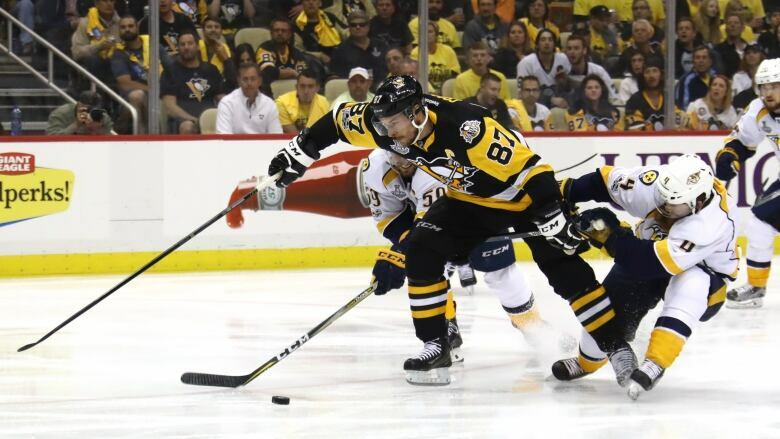 Crosby set up three goals as Pittsburgh stomped Nashville 6-0 in Game 5 of the Stanley Cup final on Thursday night. Evgeni Malkin and Phil Kessel were among the six different goal-scorers for the Penguins, who are now one win away from becoming the first repeat Cup winner in almost 20 years. "Still a lot of work to be done. But the way we played tonight, if we can build off that momentum, that's important," said Crosby. "But we know we're going to face a desperate team. We've already played two games there and know the atmosphere and know how much they feed off their fans. So we still got a lot of work to be done here." Justin Schultz, Bryan Rust, Conor Sheary and Ron Hainsey also found the back of the net in the decisive win and Matt Murray pitched a 24-save shutout, his third career in the playoffs. Pekka Rinne got pulled after giving up three goals on nine shots with Juuse Saros faring no better in yielding three on 15 shots. All five games of the series have been won by the home team with Game 6 ahead in Nashville on Sunday night. After dropping Games 3 and 4 by a combined 9-2 margin, the Penguins came out like a bunch determined to wrestle back control of the final and inch one step closer to back-to-back Cups. No team has managed the feat since the Detroit Red Wings emerged in 1997 and 1998. Their efforts started with Crosby, who broke through the Nashville defence on the very first shift of the game and hit a post. "There's a lot of competitive guys, but I don't think there are a lot of guys who can raise their level to where he gets to," said Matt Cullen of Crosby. "When he senses the opportunity, it's unlike anything I've seen, the way he steps up and raises his level." The captain drew a penalty on the play and with the ensuing power play, set up Schultz for a point blast that sailed through the pads of Rinne — this after only 91 seconds. True to Crosby's pre-game wishes, Pittsburgh soaked up plenty of offensive time and had their second of the night before seven minutes had passed with Rust beating Rinne with a backhand off the rush. Rinne had been maybe the biggest reason for the Preds winning the previous two games. The 34-year-old was especially sharp in Game 4 — notably denying Crosby on his second breakaway attempt of the game. Rinne had struggled to start the series in Pittsburgh though, pegged for eight goals on only 36 shots at PPG Paints Arena. By the end of the 20 minutes, he'd allowed three goals on only nine shots with Malkin adding the third marker with 10 seconds left. Rinne was replaced to start the second by Saros, who was making only his second appearance of the playoffs. Rocked himself in the two Penguin losses, Murray bounced back with a sharp performance as did Malkin and Kessel. Malkin entered the night leading all players in post-season scoring, but had been relatively quiet in the series and held pointless in Nashville. He was determined to have his "best game" and did so with two points alongside Kessel, who finished with three himself (one goal, two assists) in the win. But this night ultimately belonged to Crosby, who appeared driven to make something happen every time he touched the puck. He wrestled with P.K. Subban at the end of the first — both received minor penalties — and then set up his second goal moments into the middle period. Crosby grabbed hold of the puck as he strode below the goal-line and then slipped a backhand in front to Sheary, who promptly beat Saros on his 25th birthday. Crosby added his third helper and seventh point of the series on Kessel's first goal of the final. Second to Malkin with 27 points in the playoffs, the 29-year-old has emerged as the Conn Smythe Trophy favourite for what would be a second straight spring. Crosby is looking to join Mario Lemieux, Steve Yzerman and Wayne Gretzky as the only players to captain back-to-back Cup winners in the last 30 years — and first in the salary cap era. With 164 career playoff points, Crosby is now tied with Denis Potvin for 19th all-time. He also sits equal to Peter Forsberg for 20th in NHL history with 107 playoff assists. Jake Guentzel also made some history when he picked up his 21st point of the playoffs, equalling Dino Ciccarelli and Ville Leino for the most by a rookie in a single post-season. On the other side was Nashville, now not only on the verge of elimination, but potentially without top-four defender Ryan Ellis, whose night ended after two shifts in the second period.